The TTABlog®: TTAB Test: Is "BIRTHPLACE OF THE AMERICAN BIKER" Merely Descriptive of Clothing? Biker Clothing Company petitioned to cancel a registration for the mark BIRTHPLACE OF THE AMERICAN BIKER for "Clothing, namely, t-shirts, sweaters, scarves, bandanas, jackets," on the grounds of fraud and mere descriptiveness. In its brief, Petitioner argued that the phrase fails to function as a trademark, but the Board refused to consider that unpleaded claim. The fraud claim went nowhere. But what about Section 2(e)(1)? How do you think this came out? Biker Clothing Company, LLC v. Worldwide Dynamics Inc., Cancellation No. 92064143 (September 11, 2018) [not precedential] (Opinion by Judge Thomas W. Wellington). Fraud: Petitioner claimed that, given the fame of the annual Hollister, California motorcyle rally, respondent committed fraud when it filed its underlying application by authorizing its attorney to declare that it was the owner of the mark and that no one else had the right to use it. The Board pointed out that fraud is always difficult to prove, and a fraud claim "based on a purportedly false declaration statement in an application may be even more difficult to establish given the subjective nature of these statements." See 6 J. Thomas McCarthy, McCarthy on Trademarks and Unfair Competition § 31.75-76 (5th ed. 2018); see also, e.g., Daniel J. Quirk, Inc. v. Village Car Co., 120 USPQ2d 1146, 1149 (TTAB 2016) (“Fraud will not lie against an applicant who holds an honest, good faith belief in its right to register a mark and signs an application with the statutorily prescribed ownership statement, which is phrased in terms of subjective belief.”). Petitioner's proofs fell "far short" of the clear and convincing evidence required to prove fraud. Even if others have used the phrase, there was no evidence that anyone else asserted trademark rights in the phrase. "Simply put, Petitioner has not shown that another person had rights superior to Respondent’s rights at the time Respondent signed the declaration and that Respondent knew of such rights. Accordingly, Petitioner’s fraud claim fails." Mere Descriptiveness: Petitioner's testimony and evidence demonstrated that "Birthplace of the American Biker" has been very closely associated with the annual Hollister, California motorcycle rally. "The phrase is used on advertisements for the rally and ornamentally on clothing, including t-shirts, that are commonly used by purchasers to commemorate the annual rallies." As a result of the demonstrated close relationship of the phrase “Birthplace of the American Biker” with the annual Hollister motorcycle rally, and given the commemorative significance of this phrase in connection with clothing, we find the registered mark is merely descriptive of a key feature or characteristic of the goods. 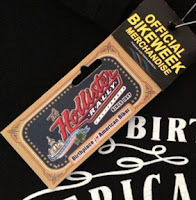 Specifically, consumers viewing “Birthplace of the American Biker” on or in connection with Respondent’s clothing, even on a hangtag or label, will immediately understand it as conveying the information that the clothing commemorates the annual Hollister motorcycle rally. Conclusion: The Board concluded that petitioner had overcome the prima facie validity of the registration, and it granted the petition for cancellation. TTABlog comment: It seems to me that failure-to-function would have been a more appropriate ground, as in the I ♥ DC case. I agree. Or “merely informational.” Also, 2(a) false association could maybe have been asserted here.